Whole roasted cauliflower is a quick and easy way to prepare the popular vegetable for a healthy family meal or elegant holiday dinner. Roasted cauliflower is also wonderfully delicious with tahini sauce—the Middle Eastern condiment that is typically served with kabobs. You can whip the tahini sauce up in no time with tahini paste (sesame seed paste), garlic, and lemon juice. If you like your food on the spicy side, just stir in a little harissa (chili pepper paste). You can find tahini and harissa at most large supermarkets in the same area as olives and salad dressings, or in the ethnic food section. Middle Eastern grocers are also a good bet. To finish this dish we sprinkle on some chopped fresh herbs and pepitas—those tiny raw pumpkin seeds without a shell. It's incredibly nutritious, too. Preheat your oven to 375° F. Line a baking sheet or shallow casserole dish with parchment paper or aluminum foil. Remove the leaves of the cauliflower, trim off the bottom stem, and wash thoroughly. Pat dry. Rub the cauliflower all over generously with the olive oil. Place cauliflower stem side down on the baking sheet or casserole dish and place in hot oven. Roast for 45 to 50 minutes until the cauliflower is fork-tender and lightly browned. While the cauliflower is roasting make your tahini sauce. Place a saute pan over medium-high heat with a light coating of olive oil. Add your crushed garlic and cook until soft and fragrant. Remove the pan from heat and add the tahini, warm water, garlic, lemon juice, salt, and harissa, if using. Whisk until well combined. 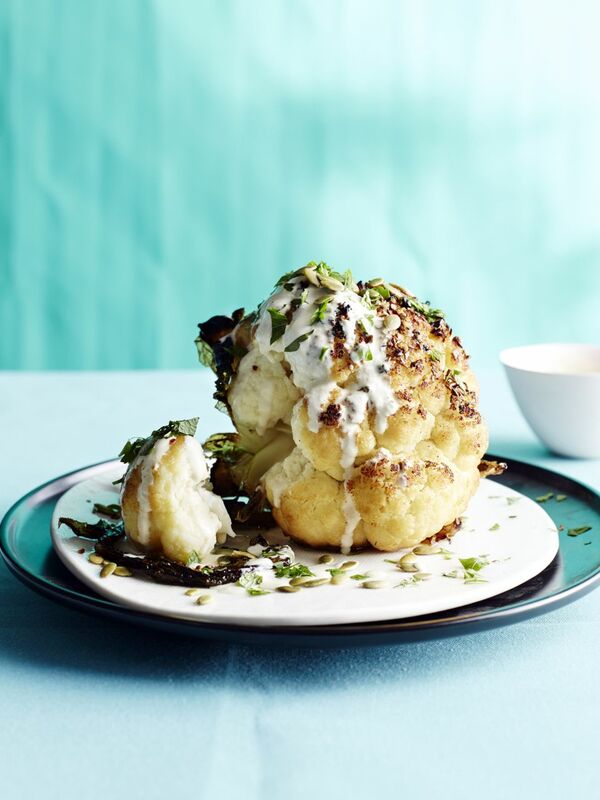 Brush half of the tahini sauce all over the cauliflower. Cut cauliflower into six wedges and place on individual plates. Drizzle the remaining tahini sauce over the individual cauliflower servings. Sprinkle the chopped herbs and pepitas over the top and serve immediately.